2018: What is God Saying to You? by Jenn Bevan – Stew Rd. My wife, Jenn, was asked to share a blog for our Living Word Church website this month. For those of you that really know my wife, you know she is someone who brings passion and forward motion into whatever she is doing. She is a courageous woman of faith and doesn’t back down from the things God has promised to her and others. I love that! For as long as I can remember, we at Living Word Church have always started the year off with prayer and fasting. 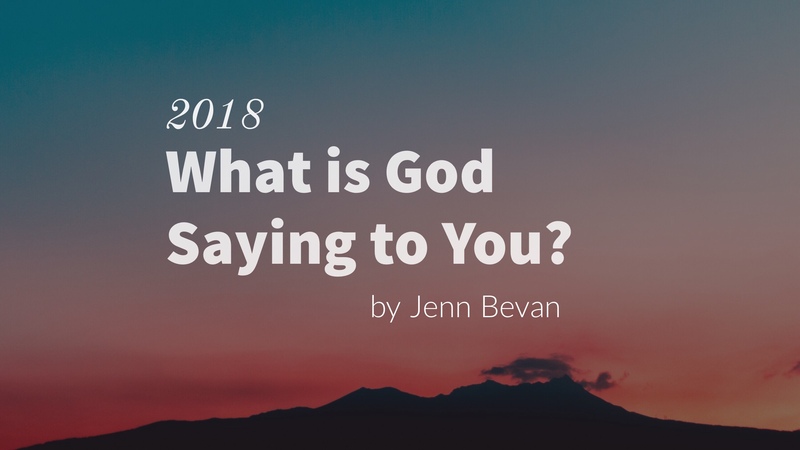 This practice has stirred in me a love and anticipation to ask God for what He is saying about the next year, and it is a great way to either throw off the previous year or run and build momentum through the coming year. It is also a great way to keep the promises of God before your eyes, especially when hard times come or the enemy is trying to lie to you, you can grab those words the Lord has spoken and read them again and again. I want to share some of what the Lord has spoken to me during 2017 and the beginning of 2018 for this coming year. Some of these points have not completely unfolded and that is the beauty of discovery, that throughout the year, God will expound upon the words He has given you or even confirm, clarify, or reveal greater understanding. Enjoy the journey!! The Father is easy to please. I have lived my whole life in pressure. My sixth grade science teacher told my mom, “You don’t have to put any pressure on Jennifer; she has enough inside herself.” Over the past couple of years, the Lord has been dismantling this pressure which is rooted in fear of failure and fear of punishment. At one point, the Lord showed me how my pressure was not His expectations of me but my own. The Father is so loving and kind to dismantle every lie and hindrance to love. He longs to love us into wholeness and give us His peace, joy and laughter. There was even one time at a soccer tournament where I was just dropping the ball: forgetting things or being late and my usual was just to get frustrated at myself and keep pushing and trying harder, which just led to more pressure, but at one point I stopped and started waving my arm above my head (as a sign of releasing failure) and from the depths of my belly came this joy. So every time I feel like I am failing, I wave my arms releasing the failure and take on His joy. It is really freeing and bringing more joy to my life. Failure is really meant to be a place to learn and grow, not a place of shame and punishment. The Father is easy to please and longs to step into our places of failure and disappointment with His love and encouragement, not condemnation or punishment. Rom. 8:1, 34-35 – So now the case is closed. There remains no accusing voice of condemnation against those who are joined in life-union with Jesus, the Anointed One…Who then is left to condemn us? Certainly not Jesus, the Anointed One! For he gave his life for us, and even more than that, he has conquered death and is now risen, exalted, and enthroned by God at his right hand. So how could he possibly condemn us since he is continually praying for our triumph? So, if Jesus is at the right hand of the Father praying for us and the Holy Spirit is interceding for us (Rom. 8:26), how can they be a divided house – praying for us to triumph, yet condemning us because we are not getting it right? THEY ARE NOT!! They are praying for our TRIUMPH!! For us to overcome!! Rom. 8:35 – Who could ever separate us from the endless love of God’s Anointed One? Absolutely no one! For nothing in the universe has the power to diminish his love toward us. Troubles, pressures, and problems are unable to come between us and heaven’s love. In everything we walk through, no matter how difficult, we are able to experience God’s love in the midst of it because there is no fear of punishment. He is so easy to please!! In 2017, one of my main words was NEVER DOUBT, from Eph. 3:20 – We have got to get beyond doubt to step out. Jesus is Perfect Theology. Our standard is the Word, not our Experience. He is wanting to work through you to see people saved, healed and delivered. Heb. 1:3 – the Son is the dazzling radiance of God’s splendor, the exact expression of God’s true nature His mirror image. As I have been reading the gospels again, I am challenged by the many times Jesus prayed for people and they were instantly healed or delivered. Starting in Matt. 8:3, Jesus reached out his hand and touched the leper and said, “Of course I want to heal you – be healed! And instantly, all signs of leprosy disappeared. V. 16 – That evening the people brought to him many who were demonized. And by Jesus only speaking a word of healing over them, they were totally set free from their torment, and everyone who was sick received their healing! Matt. 15:30 – Then huge crowds of people streamed up the hill, bringing with them the lame, blind, deformed, mute and many others in need of healing. They laid them at Jesus’ feet and he healed them all. Even as a young Christian, there has always been in me a desire to walk in the supernatural (actually doing the things Jesus did). There have been times when I have stepped out and seen God move, and then there have been times where I have prayed for something or someone and not seen it happen. That is when discouragement tries to come in, and get us off track. “But that is when we go back to the secret place. We get alone with God and cry out to him. Then when we go back out in public, we take risks” (Bill Johnson). Matt. 21:21-22 – Jesus replied, …If you have no doubt of God’s power and speak out of faith’s fullness, you can be the ones who speak to a tree and it will wither away. Even more than that, you could say to this mountain, ‘Be lifted up and be thrown into the sea’ and it will be done. Everything you pray for with the fullness of faith you will receive. The definition of perseverance: steadfastness in doing something difficult. This is connected to the above paragraph, as to where we don’t quit no matter what we are seeing. Easier said than done, yet I know God is calling us this year to persevere to see breakthrough in our own lives, our families, and the people around us. God is taking our identity from being just a title to an experience. Eph. 3:17-19 – Then, by constantly using your faith, the life of Christ will be released deep inside of you, and the resting place of his love will become the very source and root of your life. Then you will be empowered to discover what every holy one experiences – the great magnitude of the astonishing love of Christ in all its dimensions. How deeply intimate and far-reaching is his love! What are your dreams and what steps can you take to plan for their fruition? (Sometimes we can feel powerless and we are waiting for someone to open the door for us, but you are powerful and there is always something you can do to prepare for what the Lord has for you.) Rather than trying to go from zero to sixty, maybe there would be some things you could do to prepare. Ask yourself these questions: What are the skills you would need to see it happen? What are practical steps you could take to move in that direction? Who is someone that has already done what you are hoping to do that could maybe give you a few pointers? Don’t despise small beginnings; those small beginnings will build a history with God which in turn will prepare you for the dreams in your heart. Joseph was a great example of stewarding a dream. Ps. 105:17 – God’s promises to Joseph purged his character until it was time for his dreams to come true. Prov. 27:17 – As iron sharpens iron, so one person sharpens another. “Community is a vital part of our growth process. God made us to love one another and live alongside one another. It’s our community that reminds us of our greatness. When we don’t see it, they should be pushing us toward our best” (Danny Silk). Have real friendships. Be careful of only having friends on social media. FB friendships can bring disillusionment because they are not always based in reality. A picture does not always tell the truth and usually people end up measuring their weakness to someone else’s strength. Networking and Collaboration will be key in this next year. In the past, I have approached things with the idea that I had to handle it all. That approach means all the pressure is on me to have all the great ideas and abilities. God never intended us to have to figure it out and handle it all alone. As an individual, I am limited to my own abilities, but when we collaborate, the two can put ten thousand to flight. There are parts of our destiny that will only be unfolded in the relationships God puts us in. What is God saying to you about 2018? Spot on Jenn you knocked it out of the park!! Have a great year and thank you!